The Midi Canal, in existence for more than three centuries, (327 years), was constructed by Pierre Paul Riquet between 1667 and 1681, with the help of about twelve thousand workers, who dug out 7,000,000m³ of earth to connect Toulouse and Sète. 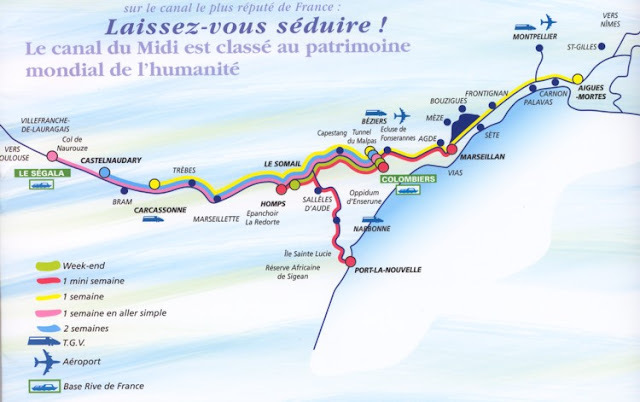 This represents 240km(150miles) of canal, built using only manpower, during the reign of Louis ⅩⅣ, the Sun King, “ Le Roi Soleil ”. Conceived to enable the transport of goods and the French Navy between the Atlantic ocean and the Mediterranean sea, it is now almost exclusively used by pleasure boats. 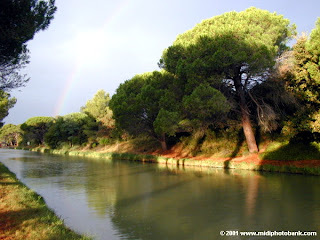 canal lined by trees, which meanders through the land of the “ Cathars ”, passing on the way locks, bridges and aqueducts of the period. You will come to appreciate the calm of the picturesque little villages, which have preserved their charm and gastronomy, practically intact since the canal's construction. Béziers is the birthplace of Pierre Paul Riquet, the builder more than three centuries ago, (327 years), of “The Midi Canal”, a truly magnificent engineering achievement which connects the Mediterranean with the City of Toulouse. The canal is now a paradise for cruising and leisure, and it is possible to hire a boat for the day, or dine out on a restaurant barge. Don't forget that certain locks, like those at Béziers, have separate times for ascending & descending.